I might have a bone to pick with Oscar voters for their choices in the insufferably bleak live action and documentary shorts, but the animation team delivered one of the few truly great sets of nominees this year. The five Oscar-nominated animated short films represent the best of the field and deliver the full spectrum of the art form by storytellers from around the world. The cherry on top is that Canadians hold the majority of slots in the category with one NFB production and two films by Canuck directors landing on the ballot—and the three films are honestly the best of the bunch. First up is the Irish ditty Late Afternoon, directed by Louise Bagnoll, which offers a delicate tale of the elusiveness of memory as life slips in an out of grasp for an aging women named Emily. Voiced by the great Fionnula Flanagan, Emily swirls around in storybook palettes as her life flashes before her eyes and blurs past with present. Her daughter, Kate (Niamh Moyles), keeps guard by her side as family members and loved ones collide and dance in bursts of colour. It’s a touching story of holding onto all that is dear. Late Afternoon, however, is arguably eclipsed by the similarly fleeting and elusive Weekends by Toronto native Trevor Jimenez. Weekends, which has the biggest haul of accolades heading into the Oscars with the shorts prize from the Annies and a slew of festival wins, is a hypnotic interpretation of one boy’s experience being scuttled back and forth between his divorced parents in 1980s’ Toronto. Told with nary a word but with a wash of haunting images, the film is the most psychologically rich nominee in the pack and it uses the size of the city to create intimidating violence through shadows and scale. It conveys the young boy’s darkness as he encounters abuse, fear, and uncertainty, but finds hope as he takes solace in action movies with his dad and some Samurai gear to escape the pain. The hand-drawn animation captures the boy’s fragile mindset with vivid colour palettes and scratchy designs that are alternatively nightmarish and optimistic. Jimenez empowers the boy through the strength of his imagination. This little samurai warrior conquers Toronto and could next take on the Oscars. The shorts blast off with a different family saga in One Small Step, directed by Bobby Pontillas and Andrew Chesworth, which demands to be seen as a double bill with First Man. The film is a rich and moving story of a Chinese-American girl named Luna who dreams of becoming an astronaut. 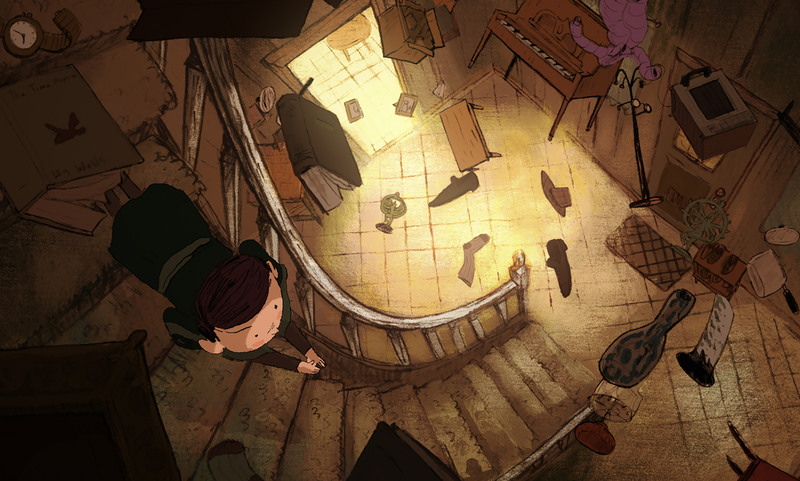 Luna grows under the wing of her father, a cobbler, and gradually realizes her quest to fly in space. 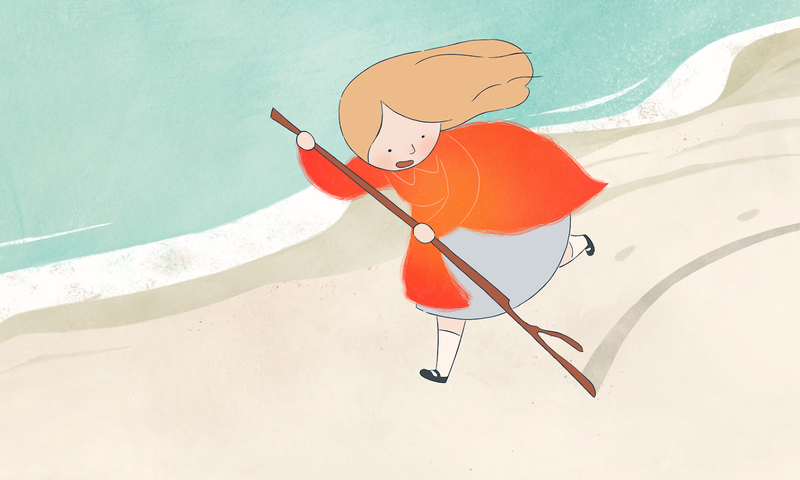 One Small Step offers understated animation and storytelling as Pontillas and Chesworth favour muted designs and colours along with a dialogue-free narrative that zips through Luna’s voyage to the moon. It is delicate and touching as it conveys the strength of the father-daughter relationship that fuels its empowering tale. One Small Step is in some ways the same movie as Bao, a dialogue-free story of a Chinese-Canadian woman in Toronto who sees her life flash before her eyes in the form of a bao bun. 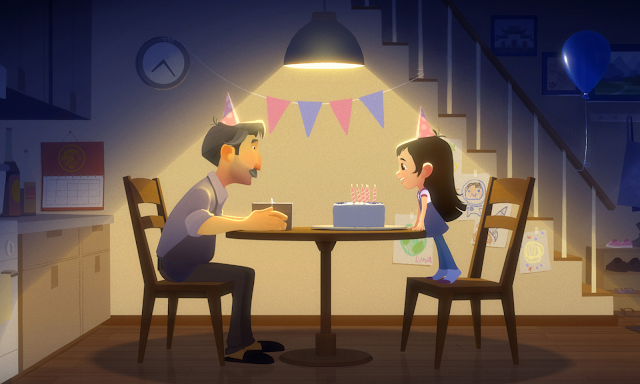 The film is gaining a lot of attention for being the first Pixar short directed by a woman with Chinese-Canadian Domee Shi at the helm, but everyone is cutting Shi short by neglecting to say how good her film is. (Champion the film, too!) Shi's richly personal vision makes the film so strong. Bao is a sweet little film about the bonds between parents and their children, and of the difficulty of letting go. It touches on many of the same points as the three aforementioned nominees, and similarly uses music to substitute for dialogue and performances, but it hits rich emotional notes as the mother dotes over her son and protects him until the bun’s time is ultimately up. Bao is also a love letter to Toronto since, like Jimenez does in Weekends, Shi lets the CN Tower stand tall and witness the vicissitudes of the family dynamic. Similarly, it’s sweet to see mother and bun ride the TTC and stroll through Chinatown. 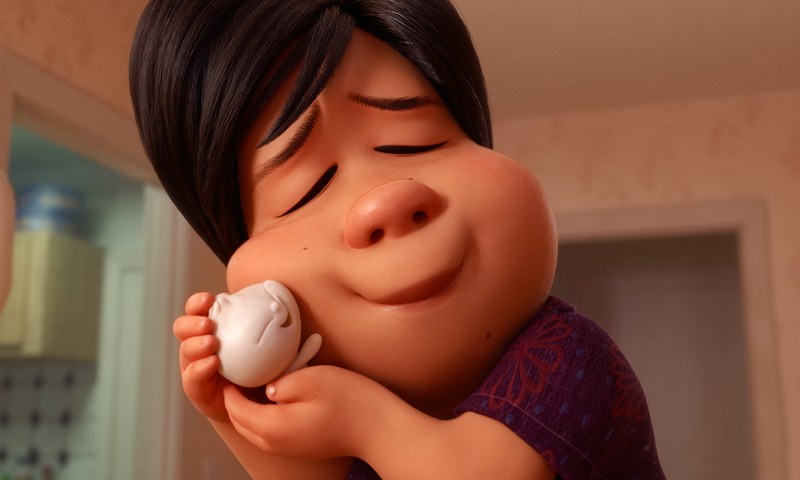 Bao is a bright, buoyant film for everyone. While Bao is a charmer and the likely winner for its sweetness and its simplicity, the final contender in the category eclipses it. A great animated film has a wonderful visual palette, engaging technique, a captivating story, and the ability to create an emotional connect. While Bao has these elements to some degree, Animal Behaviour has them in spades. This film is a riot. This delightful romp sees a motley crew of animals who convene under the therapeutic guidance of Dr. Clement, a dog. 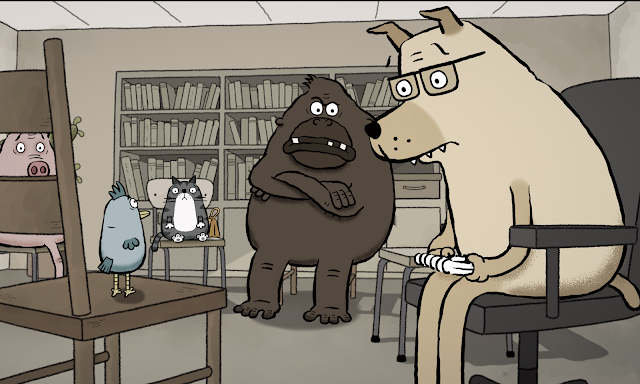 Dr. Doggie listens compassionately to his patients—a skittish slug, a nymphomaniac praying mantis, a gluttonous pig, an OCD cat, and a timid bird—who share their peculiar, if humane, foibles. Chaos ensures when an ape with anger issues storms the party and the lines between man and beast explode to spectacularly hilarious effect. The film is smartly observant of elements of human behaviour that show us at our most primitive as the animals laugh and gripe like two-legged humanoids fixated on Tinder swipes and beach bodies while fueled by six-dollar coffees. It’s a clever, sprightly, and laugh-out-loud funny bag of tricks that I thoroughly enjoyed. Partners in life and in crime, the duo of Alison Snowden and David Fine land a winner with this wickedly funny NFB film. They deliver once again with their quirky/semi-stick-figure-ish aesthetic that’s become their hallmark, and offer the only film of the nominees that feels like a complete package. Animal Behaviour stands out from the pack thanks to the quality of the writing and the spiritedness of the acting. Few of the other nominees feature any dialogue or vocal performances, and while they’re often wonderful in their simplicity, Animal Behaviour simply delivers filmmaking on a higher level. It’s an easy vote, at least for this viewer. The Oscar nominated shorts open in Toronto at TIFF Lightbox on Feb. 8. 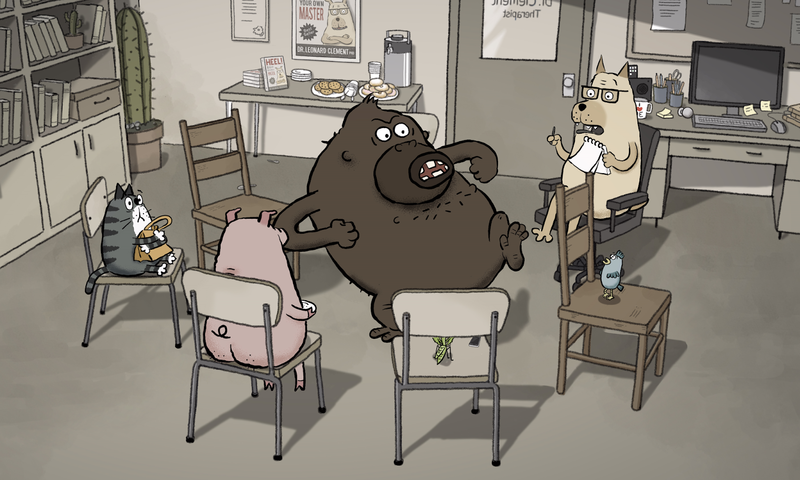 Read reviews of the nominated live action shorts here and the short docs at POV.